Cotoneaster make a fantastic hedge plant which offer numerous advantages and benefits to your garden. A beautiful combination of seasonal flowers and berries as well as evergreen foliage in some species make Cotoneaster hedges one of our most popular as they fully decorate any garden or outside space with colour, and attract plentiful wildlife. The name Cotoneaster stems from the Latin cotone for quince and aster for resembling because of its similarity to the plant Quince. It is a relation of Hawthorn hedging and is native to the Palaearctic region. Each variety of Cotoneaster that we offer has something that makes it appealing. Differences in when they look at their best or variations in their foliage mean that each variety is popular for different reasons. Some prefer the weeping branches of lacteus for an informal hedge and others prefer the Franchetiis for a more formal hedge. Whatever the need or personal preference, the year round interest and combination of flowers and berries has ensured that all 4 varieties remain popular. Cotoneaster is a very useful plant with a variety of benefits. If you are after a hedge to cover walls and fences then Conoeaster Horizontalis (Wall Cotoneaster) is perfect for the job and has a fantastic architectural structure. Lookout for the exciting red berries in Autumn as well as flowers in Spring that are white with a lovely pink tinge. It also benefits from a stunning Autumn colour as the small green leaves change colour to a shade of red/orange. For a hedge with evergreen foliage you can use Cotoneaster Lacteus which possesses lovely weeping branches creating a beautiful casual effect. A real year round interest is provided by white flowers in the summer and red berries which carry on into the winter as well as dark evergreen foliage. 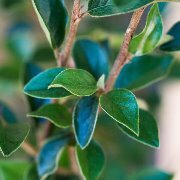 Cotoneaster Franchetii (Franchet's Contoneaster) is a beautiful evergreen hedge plant with arching branches covered with small, oval leaves. 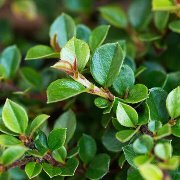 A colourful and productive hedge, Cotoneaster Franchetti will develop attractive white flowers and bright orange berries as well as its evergreen grey-green foliage. Cotoneaster Simonsii is a great option if you are looking for a semi-evergreen shrub with an upright habit. Providing pretty white flowers in Summer, Himalayan Cotoneaster also provides large scarlet berries and dark green foliage. The leaves of Cotoneaster Simonsii also provide excitement as they become tinted with red in the Autumn. Different Cotoneaster varieties will have different ideal hedge heights. Franchetii, Lacteus and Horizontalis are perfect if you are looking for a hedge to grow between 1m and 2m. All three typically grow at around 20-40cm a year. 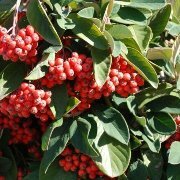 Cotoneaster Franchetii and Lacteus hedge plants only require a light trim once a year, after the berries have fallen whereas Cotoneaster Horizontalis requires pruning in late winter or early spring. Cotoneaster Simonsii will be at its best at heights between 1-1.5m and again grows at around 20-40cm per year. February is the time to trim your Cotoneaster Simonsii hedge to shape and then if required simply prune any unruly growth after flowering. Some Cotoneasters are deciduous whilst others are evergreen. 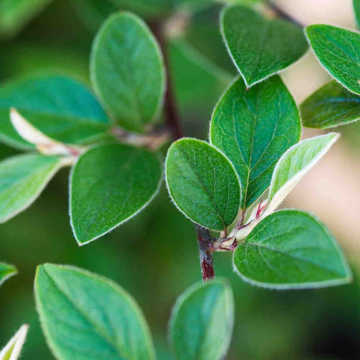 Here at Hedges Direct we stock 2 types of evergreen Cotoneasters; Franchetti and Lacteus. These evergreen plants are incredibly popular as they keep their colour all year round offering constant cover which is pleasing on the eye as well as being beneficial to your local wildlife during the Winter, making sure there is a year round home for the birds and small animals who live in our gardens. The flowers and berries are seasonal and so you can expect some change throughout the year safe in the knowledge that the foliage will stay bright and colourful. Cotoneaster Simonsii can be considered semi-evergeen as in mild winters it can sometimes keep its leaves. Cotoneaster is the perfect hedge plant for those of you trying to create an attractive garden for wildlife. The natural flowers and berries that occur across the different varieties of Cotoneaster offer food for birds and small animals, whilst the flowers provide a brilliant source of nectar for the different bees that may arrive in your garden including honey bees and bumblebees. As well as birds and bees, Cotoneaster attract certain varieties of butterfly.